Google unveils Nexus 6P and Nexus 5X smartphones | What Hi-Fi? 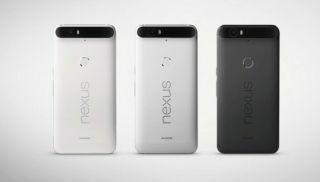 Google has announced two new smartphones as part of its Nexus range. The phones cater for mid-range and high-end markets and will both come with the Android 6.0 Marshmallow OS. Google says the Nexus 6P is its most premium phone yet. Made by Huawei, it comes with a 5.7in WQHD (Wide Quad High Definition) screen with 2560 x 1440 resolution, 515ppi (pixels per inch) and Gorilla Glass 4. It will run on a Qualcomm Snapdragon 810 v2.1 processor with 3GB of RAM, and will have 32GB, 64GB and 128GB storage options. There’s no microSD card for expansion due to the phone’s series 7000 aluminium unibody. A 3540mAh battery is said to deliver an all-day battery life, and USB Type-C connectivity will allow for faster charging. Google says 10 minutes of charge will give seven hours of battery life. The 6P also comes with a fingerprint sensor on the back that can be used for unlocking the phone, using Android Pay and authorising Play Store purchases. On the back you’ll find a 12.3MP camera with 1.55μM pixels that allow more light in and should, in theory, deliver better results in low light. The camera also has a laser autofocus for faster focusing and 200fps slow-motion video. An 8MP camera with 1.4μM pixels and HD video capture adorns the front. The Google Nexus 6P will be available from October in silver, black or white finishes, costing £449 for 32GB, £499 (64GB) and £579 (128GB). The Nexus 5X is made by LG and will come sporting a 5.2in Full HD screen with 424ppi and Gorilla Glass 3 protection. Google says the 5X is the direct replacement for the Nexus 5. Under the hood you’ll find a 64-bit Qualcomm Snapdragon 808 processor with 2GB of RAM, which places it in mid-range territory. It also packs an Android Sensor Hub, an always-on, low-power processor that brings the phone to life immediately when you need it. Other specs include a 12.3-megapixel rear-camera with 1.55μM pixels, 4K video capture, and dual-flash. A 5MP camera with 1.4μM pixels is on the front. A fingerprint sensor on the back offers the same functionality as on the 6P, and storage options will be 16GB or 32GB with no microSD card slot for expansion. The Nexus 5X will also come with USB Type-C which is said to provide faster charging times: Google says 10 minutes of charge time will give you four hours of battery life (compared with seven hours on the 6P). It will ship in October with Android 6.0 Marshmallow and be available in black, white and green finishes for $379 for 16GB and $429 for 32GB in the US. UK prices for the 5X start from £339. Android 6.0 Marshmallow is said to bring the best Android performance to date. A new 'Now on Tap' feature will let you carry out extra functions depending on the content on screen. The example Google gave at the launch was a message from a friend about making a dinner reservation at a restaurant. Now on Tap found the name of the restaurant and time suggested. It gave the user a link to the restaurant's website, and review websites, as well as a calendar event. The “OK Google” voice command is still on hand to take notes, set alarms and compose messages, and Nexus Imprint lets you unlock your phone and use Android Pay with a fingerprint. We'll bring you more information about Android 6.0 Marshmallow as soon as we get it.